I've spent the last several days in Tompkins Square with the hawks, so haven't had a chance to go home and process my photos yet. 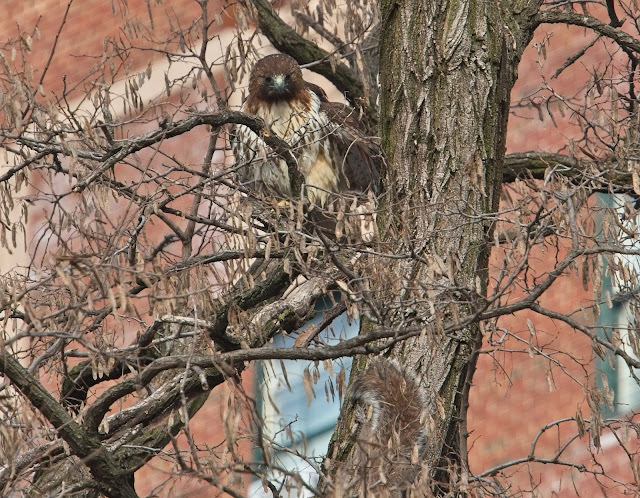 There was some hawk drama in the park today when Dora fought off an intruding red-tail. Details can be found over at EV Grieve. Looking at the photos, I can say the intruding hawk was not Braucha/Nora. Hawk fights do sometimes happen. Photographer Susan Kirby has photos and video of one such scuffle in Central Park back in December, which you can see here. This is just a short post to say Dora won the fight and she's doing ok. When I left the park tonight around 7:45pm, she was in the nest and Christo was roosting in a tree. Here she is earlier in the day confronting a squirrel. I'll post updates from this last weekend soon.